The 528 Customs Goon RDA is one of the most popular RDAs on the market, and for good reason! The Goon RDA definitely became a favorite for many vapers, especially people who love to build exotic coils! 528 Customs have finally released the Goon 22 RDA, which is the smaller brother to the original and full sized Goon RDA. There are tons of different RDAs on the market currently, which means there is a great amount of competition! In this review, I will go over everything there is about the Goon 22 RDA, and tell you whether or not if I recommend it, and how it compares to the competition! The Goon 22 RDA comes in a small pouch or bag, similar to that of the original Goon RDA. The pouch itself is quite small, but definitely feels of good quality. The packaging may concern some people as it is not in a traditional box, but I assure you my Goon 22 came spotless with no issues. I actually like this packaging, and glad to see something different as most RDAs do come in some sort of box. I definitely think that this is unique, and adds a nice touch to the overall presentation of the RDA. You can also use this pouch for different reasons such as keeping your coils in there! The Pouch has the logo of the Goon 22 RDA, which is basically the same as the original Goon. This version, however, has a 22 labeled on it so you know it is the Goon 22 rather than the original Goon. Again, I think this is a nice touch to the presentation of the RDA. These are certainly small aspects to look at, but I do think that great presentation of a product is always positive. Upon taking the Goon 22 RDA out of the pouch, you can just see the quality immediately. 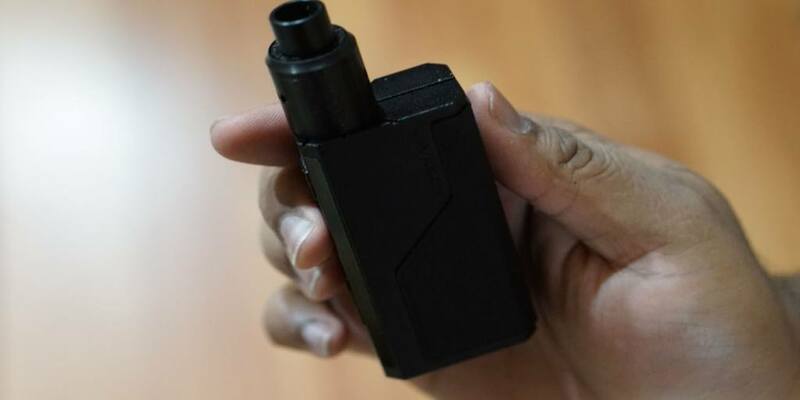 This version is definitely quite smaller than the original Goon and you sure certainly see that in the picture within the article. The difference in size is not huge, but definitely noticeable, especially in person. I choose the black version, and the quality of the black finish is excellent. It is more of a normal black finish rather than a matte black, so if you are deciding on what color to choose, hopefully this would help. Included with the black version of the 528 Customs Goon 22 RDA you do receive two drip tips. One is much wider than the other, and sits flush on the top cap. There are no gaps either with the barrel section. I think this is a huge pro, as many companies only send out an RDA with a single drip tip option! Also, there are tons of customized drip tips available online that can fit the Goon 22 RDA if you are not happy with either drip tip. I do think that either drip tip was comfortable, but preferred the wider bore drip tip. I preferred that specific drip tip due to how I personally like to vape, but like said before both seemed comfortable upon first taking it out of the packaging. The copper 510 pin is protruding enough to use on a hybrid mechanical mod, so this is definitely a huge pro in my opinion! I do want to mention that I did use this RDA on a hybrid mechanical mod with no issues. Included with this RDA you do receive a bunch of extras such as post screws, and o-rings. This is always a good thing, and glad it was included. Upon taking the top cap off, there was literally no sign of any machine oil in this RDA. 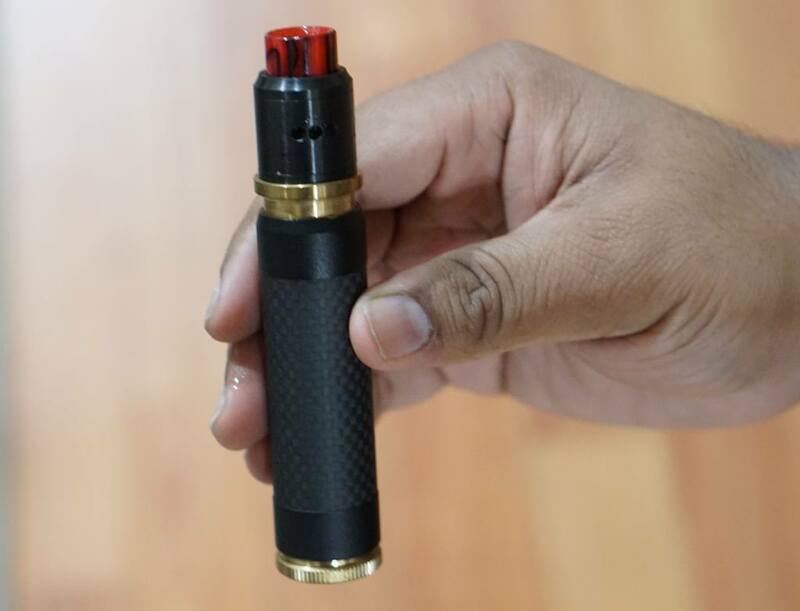 This is definitely another huge pro, as I hate when atomizers come soaked in machine oil. However, I always recommend vapers to at least wash out the atomizer before using it for the first time. In addition, what I noticed right away as well when first inspecting the RDA is how much smaller the deck section was in comparison to the original Goon RDA. It is expected, of course, that this RDA would have a smaller deck due to its size difference, but it is still worth mentioning. The deck itself is pretty much the same as the original Goon, so this was definitely a good thing! Overall, my first impressions of the 528 Customs Goon 22 RDA was all positive! Everything came clean, and the presentation was well done! Building on this RDA is definitely easy. The clamp styled posts are just easy to use, and if you are worried about building on this RDA, don’t. It really is easy to build on this RDA, but I would not say as easy as a velocity styled build deck. It is almost as easy to build on as a velocity styled build deck, but honestly just not quite as easy. However, like said before, it still is quite easy regardless. One thing I did notice though when building on the Goon 22, is that it definitely cannot fit huge builds like the original Goon. This is to be expected due to the size difference, but I do think it is worth mentioning. You can definitely fit bigger builds in here with no issue, but not gigantic builds. Also, since the posts themselves are smaller in size on the Goon 22, thicker builds may prove to be a slight issue. I personally did not try to install any ridiculously large builds in here, but normal Fused Claptons and Alien builds fit with no problems. Overall, building on this RDA is a total breeze. If you are used to the Goon RDA, then this is nothing different aside from the size difference. This is probably the most important question of this review, how does the Goon 22 perform, especially in comparison to the original Goon? Firstly, I can certainly say that the performance of this RDA is outstanding! My favorite build in the Goon 22 RDA was a dual Fused Clapton Coil. The specifics of the coil build were 26GA x2 wrapped over with 36GA Kanthal. The resistance of this build came out to about 0.16 ohm. If you are attempting build such as this, please understand ohms law and battery safety! It is important to always understand the batteries we use, especially in mechanical mods. I recently published an article going over some of the best 18650 batteries right here. If you are interested in reading that article, you can also click the link below! Click Here to Check Out The Best 18650 Battery Article! I did try other coil builds in this RDA, but honestly the Goon 22 was made to put larger and more complex builds rather than simple round wire builds. Round wire builds worked completely fine in this RDA, and had no issues with them, but I just preferred the previously mentioned build overall. With this Fused Clapton build mentioned before, the vapor production was excellent. This build was a bit warmer than normal round wire builds, but I do prefer warmer vapes. You can certainly cloud chase with this RDA with ease if you wanted to! In addition, the flavor coming off of this RDA was excellent. Honestly, you really wouldn’t expect the flavor to be that great off of the Goon 22, but it certainly is good. I wouldn’t necessarily call this RDA a flavor chasing RDA, but I’m sure if you close off the airflow enough, you can probably flavor chase with it with ease! With the flavor I was getting, I honestly didn’t feel the need to close off the airflow a ton to increase the flavor, even though if you did, it certainly increased it a bit. I was absolutely satisfied with the flavor I was getting from the Goon 22. Speaking about airflow now, my preferred airflow setting for this RDA was with two airflow holes open and one closed. I found with this airflow setting, it gave the perfect amount of restrictiveness. Of course, other vapers may feel differently and prefer different type of restriction. For me though, it was absolutely perfect that way. With the airflow wide open, the flavor was still good with this Fused Clapton build, but it did cut down on the flavor a bit. That is to be expected though, but the flavor was still solid overall. Also, with the airflow wide open, the draw is pretty airy. Honestly, with it wide open, it was just a bit too much airflow for me, hence is why I preferred one airflow hole to be closed off. Overall, the performance was extremely good out of the Goon 22 RDA! I was satisfied with both the flavor and vapor production. However, I do want to talk about how it does against the original Goon RDA, which is what we will get into next! 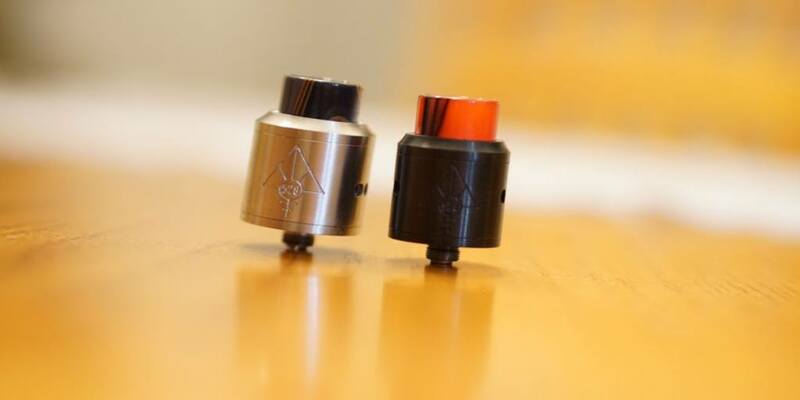 As said previously, the original Goon RDA is one of the most popular RDAs on the market and for good reason! Well, how does the smaller Goon 22 compare? 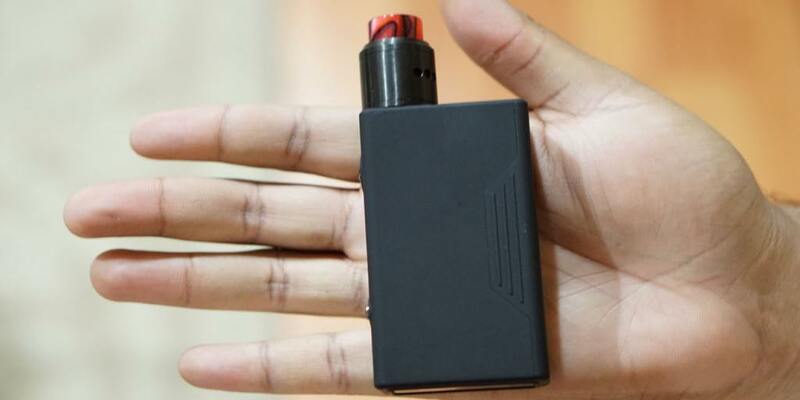 Honestly, there are small differences between the two RDAs, and I have covered a few of them already in the article. Building on both of these RDAs is extremely easy, and won’t really prove to be an issue to most vapers, especially those who know how to build their own coils. However, if you want to build much larger coils, then I do think the Goon RDA would be a better match. Like said in a previous section in this article, you can easily fit most builds in this RDA, but not everything. The flavor on both of these RDAs is also excellent, and much better than I expected with either. However, I think due to the smaller size of the Goon 22 RDA, the flavor is slightly better. I typically used the same build for both RDAs, and I do notice that the Goon 22 has slightly better flavor. I would not say the difference is major, and should sway you from one to the other, but if this is something important to you, the Goon 22 will have slightly better flavor. The vapor production from each RDA was essential the same overall. With the same coil build, I did not really notice any difference whatsoever. Honestly, it all comes down personal preference with these two RDAs. Both of them have excellent performance and flavor. If you want to build larger coils, then the original Goon would be better for you simply, because of its size. If you want slightly better flavor, and a smaller design, then the Goon 22 would be best. Either one of these RDAs is excellent, and could easily be used all day for any vaper in my opinion. Even though there was all good things said so far about the Goon 22 RDA, there are some slight cons to be mentioned, which is the next section! There are some slight cons to this RDA. For one, this RDA can certainly get quite warm when chain vaping. It would get warm enough where I felt that I needed to let it cool off for a minute before vaping it again. I do think the build can be the cause for this issue, since it only really happened with the Fused Clapton build. I do think this is worth mentioning though, since many people who purchase this RDA will install these types of builds. I do not think this is a huge con as it only happens when chain vaping, but it has to be mentioned. Another con is that I did notice some slight spit back. Of course, with a Fused Clapton build you can easily experience spit back with any atomizer. However, even with simple builds, I did experience a small amount of spit back, but not nearly as much as a Clapton build. For me, this was not a huge issue as it was not constant spit back nor was it a lot of spit back, but it happened enough where I felt that it should be mentioned. The last con to this RDA is that e-liquid can easily build up in between the airflow control. This issue would happen often if you change your airflow settings a lot, and would definitely be more noticeable as it would just push the e-liquid out around the airflow holes. Since this is a 3 piece RDA, it is easy to clean when this would occur. Again, this is not a huge con, but definitely worth mentioning as this can get annoying. Even with its cons, this RDA is still quite great, which leads me into the next section, my conclusion! In conclusion, the Goon 22 RDA is a solid RDA overall. The performance is great, and the flavor is excellent. Building on this RDA is extremely easy, and the quality is top notch. For the price, this RDA is definitely hard to beat. Between the original Goon RDA and this new Goon 22 RDA, I really couldn’t choose between the two. I still use both of them in rotation, and have been satisfied with both of them immensely. Like mentioned before, there are small reasons on whether to choose either one. It definitely is a hard choice if you had to choose between them. There are slight cons to this RDA, but honestly they are not deal breakers. The spit back was minimal, and it only got warm when chain vaping. All in all, the 528 Customs Goon 22 RDA is definitely a winner. The performance, the looks, the flavor, and just about everything else about this RDA is simply amazing. If you are looking for a solid 22mm RDA, this is definitely an RDA to consider! Hopefully this review has helped you on your next RDA purchase! Thanks for reading! If you have any comments or questions, feel free to leave them below!